As part of a project to restore species-rich grasslands on ex-arable land, robust Tinytag data loggers record soil temperature and RH to help understand planting and growing conditions. The loggers provide patterns of temperature and humidity data to help optimise seed germination. Restoration of species-rich grasslands, that are of high value because of the diverse flora and fauna that they support, is part of the UK's strategy to preserve its native biodiversity. 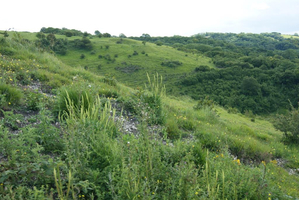 The NERC Centre for Ecology & Hydrology (CEH) worked in a project to test new methods to restore such types of grassland at sites where they have disappeared due to agricultural intensification. Understanding what goes on at grass roots level with regard to abiotic conditions such as temperature and humidity is an important part of the process. 192 Tinytag data loggers have been used for this purpose at the Pegsdon Hills Nature Reserve in the Chilterns from the summer of 2008. Intensive arable farming and intensified grassland management in the UK have resulted in the loss and fragmentation of high quality, species-rich grasslands. A small number of high yielding grasses that are better adapted to the conditions of high fertility generated by intensive agriculture arable farming, have displaced wild flowers and herbaceous flowering plants (known as 'forbs'), such as rock rose, milk-wort and wild thyme. The NERC Centre for Ecology & Hydrology is looking at better ways to establish such species-rich grasslands at existing agriculturally improved restoration sites. Such sites often experience seed regeneration difficulties, as many forb species are quite rare these days and restricted to a few remaining sites less affected by agricultural intensification, and thus generally do not naturally colonise restoration sites. Typically the sites are chalk grassland. A second focus of the project is to establish management regimes to prevent high yielding 'scrub' grasses out-competing wild flower species after they have been introduced from seed or via pre-grown 'plug' plants. The data loggers have been deployed 3 times a year, in spring, summer and autumn, for one week at a time. The loggers have monitored factors that are known to affect plant establishment. Temperature and humidity data has been recorded at surface level, and temperature also in top 10cm of the soil profile. These factors are important for at least two reasons: first, the seeds of many species possess inbuilt mechanisms to time germination in response to fluctuations in light and moisture levels. Too little fluctuation indicates too much overlying dense vegetation, cutting light and taking moisture, which would prevent new establishment from seed. Seed germination in these species therefore only takes place when there is sufficient fluctuation, indicating favourable conditions for establishment. Second, the tiny seedling stage of a plant is the stage most vulnerable to extremes in abiotic factors such moisture, and getting these factors right is of crucial importance for successful re-introduction of rare forb species. Dr Markus Wagner is a Grassland Ecologist and team co-ordinator of the project. He comments: "The Tinytag data loggers have proved reliable, sturdy and easy to use. They have provided us with patterns of temperature and humidity data that we can relate to what we already know about seed germination in these conditions and that help us with the interpretation of the results of our study. Optimising methods of re-introduction offers us a better chance of maximising establishment from seed which is often hard to come by due to a lack of suitable 'donor' sites that can be used for seed harvesting". The data can be downloaded onsite but in this case is downloaded at the research centre using Tinytag Explorer Software. The project, funded by DEFRA, will continue to refine methods for restoring species-rich grassland, meeting the Government's biodiversity strategy but perhaps, more importantly, helping to preserve a countryside rich with flora and fauna. The Centre for Ecology & Hydrology (CEH) is the UK's centre of excellence for research in land and freshwater environmental sciences. Their work encompasses a wide range of environmental disciplines ranging from the smallest genes to whole Earth systems.